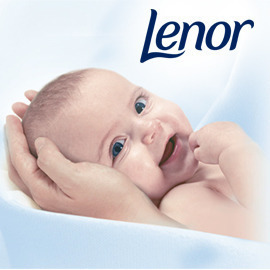 Bring joy and satisfaction to new parents as they care for their babies with Lenor Sensitive. Lenor Sensitive is a fabric conditioner that cares for your fabrics while making them soft and fresh smelling. In fact, when it comes to scents, Lenor Sensitive has the most-loved light baby scent compared to competitors’ sensitive variants. Create an emotionally engaging visual that shows new parents how Lenor Sensitive makes baby’s clothes soft and/or gives them a light baby scent. In a poster with a tagline, please communicate one of these two aspects.